This is a big release! Several months in the making, this app and firmware release brings serious ease of use and long awaited features. Read on to see just the highlights – and check out the full change log at the bottom to see all of the improvements. We really poured a lot of time and testing into this release. If all looks positive from feedback, we may just stamp it as an official release; otherwise we’ll have a point-release to fix any small issues that come up. Let’s see how well we did! RaceCapture App 1.11.0 brought sophisticated CAN bus presets, and now we’re closing the loop with the ability to pre-select CAN bus configurations, making it a snap to import mappings for many channels at once. It’s damn near plug-and-play! Like the CAN bus presets, OBDII has it’s own world of standard and OEM specific channels. You’ll be able to import presets for standard channels as well as OEM specific mappings for Toyota, Subaru, Ford, Nissan and much more. A long time coming, and we’re excited it’s finally done. 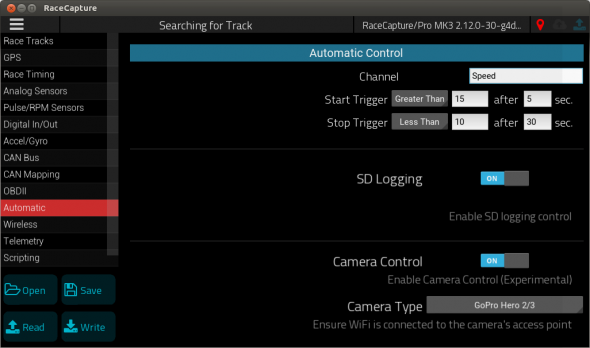 RaceCapture/Pro and RaceCapture/Apex feature sophisticated analog channel mapping capabilities, but they really need to be paired with an easy button to quickly import a sensor calibration. Now, v1.12.0 will bring you the ability to map sensors from a library of presets – so easy! 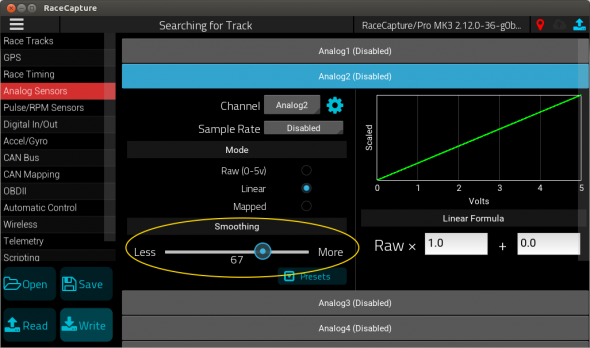 We’ve exposed a hidden firmware feature – analog channel smoothing. This will help account for slosh in your fuel tank, or smooth out other sensor readings. A stashed feature we pushed across the finish line – this is one that has some amazing potential as we grow the capabilities. In an effort to visualize race car data beyond your typical squiggly lines, these new dashboard views will stimulate your eyeballs as much as they will quickly convey critical information. You’ll enjoy this as one of the new dashboard views available in 1.12.0. So, tell us – what car models are we missing? We feel bad we let this one slide for so long. Configuring alert ranges has been more than challenging, making it tough to select precise values, especially on a small screen. We’ve added the ability to set the alert ranges directly, which should bring significant relief to just about everyone out there. Again, sorry this one took so long! We’d be incomplete if we didn’t mention it here, but it really deserves it’s own blog post. Combined with the 2.13.0 firmware, we’re bringing automatic logging control + synchronized camera control – no Lua scripting needed! Configure the start trigger with the parameters you want and test! Due to variances in GoPro hero cameras, especially with Hero 4/5 WiFi stability, the camera control is currently considered experimental. Post your testing feedback in the RaceCapture Support Facebook group or in the Autosport Labs support forums! Back up your current RaceCapture/Pro configuration by reading the current from your unit and saving it to a file. This is important as your system will revert to factory defaults after upgrading. When complete, your firmware will report the 2.13.0 version number in the status bar when you connect to your RaceCapture system. Windows, OSX, Raspberry Pi v1.12.0 installers: Get it from our downloads page under the App Beta section, and follow the standard installation process. If installing on the Raspberry Pi, follow the special Raspberry Pi installation guide. Note: If you un-install your current version be sure to first export and save any sessions you may have, as these will be wiped along with the app data. Amazon App store (Fire devices): Amazon does not have a way to beta test apps, so you will need to manually install the APK until it is fully released. Install the .apk directly from our downloads page. iOS: Not available yet, we are working through a 3D rendering issue before we can submit it to the Apple store. We’ll update this space when it is available. Get cutting edge, high performance real-time telemetry for your race and street car. Learn more about RaceCapture!